In Mary Martin’s autobiography she offered up the idea that everyone is only supposed to meet a certain number of people before the circle closes and you begin meeting the same people again – long after the initial contact. I cannot say if this theory holds any water, but I can say that it has led me to notice when people I have run into in one context become someone I later know in another. Benita was our new chorus and drama teacher, and that is primarily how I have known her ever since. Still, it was obvious that a hunger, as yet unfulfilled, lived there as well. She would speak of the promise she made to herself in the midst of a tough childhood: that some day she would be on Broadway. There was always an air of wistfulness in knowing, though she was doing good work for kids who deserved it, that dream had never panned out. 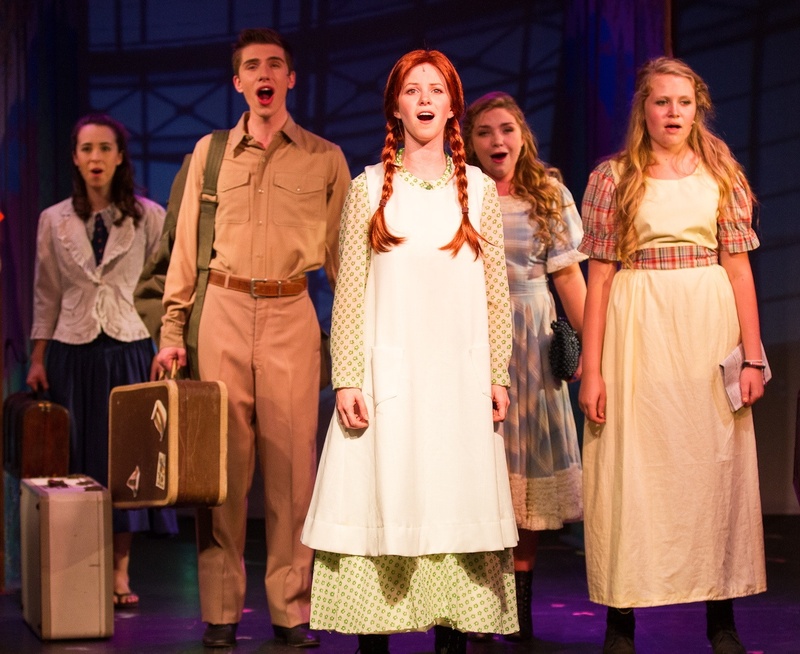 Then, in August of 2012, I received an invitation to “Bend in the Road,” a musical based on the novel “Ann of Green Gables,” at the Carrie Hamilton Theatre in Pasadena. Actually, I was told that I had no choice but to be there. Benita had written a musical with friend Michael Upward, and she wanted to know what I thought. The show was funded by a Kickstarter campaign, and it was bare bones: a mix of professional and amateur performers, minimal sets (many involving projections of work by Benita’s art student daughter). Still, the seeds were there. It had the aura of something which just might work. (My review is in the archive from September 2012.) I was pleased for her, and told her I hoped it would have a life beyond that tiny stage. And that, I thought, was that. But that girl with a Broadway dream wasn’t giving up. She, her writing partner, and her producer felt there was enough “there” there to send the thing to the New York Musical Theatre Festival, where it was accepted. Now Benita is getting some great traction. She was featured in the magazine of the National Education Association (the nationwide parent of her local union) http://neatoday.org/tag/benita-scheckel-anne-of-green-gables/, has started rehearsals, and reported yesterday that she was walking the streets of Broadway in a pair of killer heels. Of course her time this summer is not all about the glamour. She’s in the midst of re-writes and adjustments. Her young star, Alison Woods, was part of the NY deal, but the rest of the cast is new, and is now directed not by Benita (who admits she only did so out of budgetary necessity) but by veteran NY director Benjamin Endsley Klein, giving a needed fresh and dispassionate view of what this show is, what it needs, and where it can go. So, if you happen to be in New York this July, take the time to catch this one. I will be on the east coast roughly at that time, and if I can get into the city I just might. Who knows where the show will go from here. It might end up picked up for some form of New York run. It might end up on the regional, or semi-pro, or community stage. It might be gone after this summer. In any case, Benita Sheckel, the girl who dreamed of Broadway is there. That, in and of itself, is something nobody can ever take away.